Penny Stock - What Does It Mean? What is a penny stock? 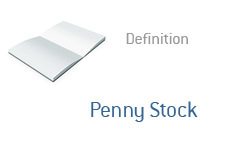 What is the definition of the term penny stock? The definition of a penny stock is a bit more complicated than you might think. The literal definition of the term would be - a stock that trades for less than $1. Meaning, the stock is trading for just pennies. For instance, a stock that is trading for 50 cents per share? That would be a penny stock. Many times a stock that is trading for more than $1 is also called a "penny stock" - what gives? The term "penny stock" can also apply to highly illiquid companies that trade on the pink sheets or through the OTCBB. A $2 stock that trades on the pink sheets may be referred to as a "penny stock", even though it is trading for $2. The term "penny stock", in a broader sense, can refer to any highly risky, highly speculative stock that doesn't trade on a major index such as the DJIA or NASDAQ. A $5 stock could conceivably be thought of as a "penny stock" if it was illiquid, highly risky and traded on the pink sheets. Again - the literal definition? A stock that is trading for less than $1. The more commonly used definition? Any risky, illiquid stock that is trading on the pink sheets or the OTCBB.